The hearing of a Zimbabwe Constitutional Court case in which the Movement for Democratic Change (MDC) Alliance is seeking to overturn the results of the recent presidential election began in Harare on Wednesday. Lawyers representing the opposition party say a run-off poll is unavoidable, judging by the evidence they have. Police kept a heavy presence in the Harare central business district on Wednesday after appealing the previous day for calm during the hearing. Nelson Chamisa, the MDC Alliance candidate, claims the vote was manipulated by the Zimbabwe Electoral Commission in favour of the incumbent, Zanu-PF candidate Emmerson Mnangagwa. Advocate Thabani Mpofu, representing the MDC Alliance, said their case was based on allegations of systematic manipulation by the electoral commission. He alleged the commission was sitting on more than 9,000 votes that had come from “ghost” polling stations, but said their case was not premised on what was in the ballot boxes. Mpofu said it was not possible to have gathered all the evidence in 48 hours to allow them to apply for the opening of the ballot boxes. They had therefore chosen to dwell on systematic manipulation by the electoral commission. Zanu-PF advocate Lewis Uriri said a claim by Chamisa’s lawyers that the numbers did not lie could be founded only on official figures announced by the electoral commission. “The only clear, direct and admissible evidence before the courts is that provided by the electoral commission, and that evidence shows a return of 50.67%, which is above the 50+1,” Uriri said. Uriri said Chamisa had deliberately chosen not to lead primary evidence because he was afraid of what was in the ballot boxes. The Zanu-PF lawyer further argued that Chamisa had filed his papers outside the time frame stipulated by the Constitution of Zimbabwe. “The constitution states that an application must be filed within seven days,” he said, adding that Chamisa chose to blame the sheriff of the court for delays in the serving of the papers. 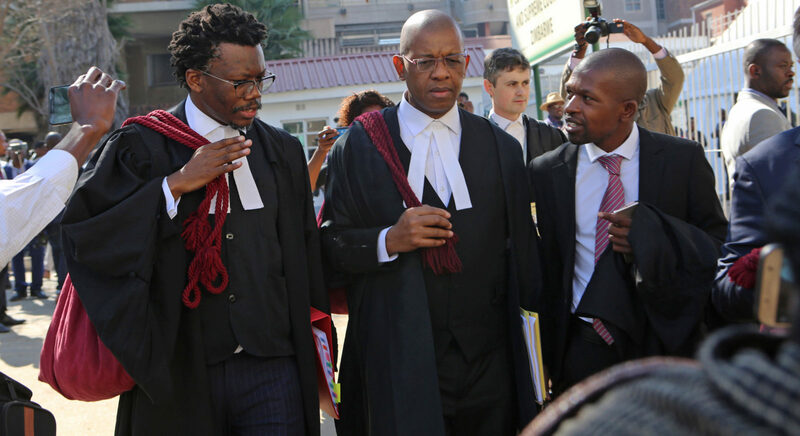 Mpofu said the issue of filing was beside the point as the court needed to deal with the merits of the matter. He said an affidavit from one Madzudzo, an MDC Alliance agent, showed that some people had arrived with unpopulated V11 forms for the agent to sign after polling had closed. V11 forms contain figures of all votes and are signed by the polling agents for each candidate and electoral commission officials at each polling station. Madzudzo refused, which Mpofu said was evidence of manipulation by the electoral commission after the process. He said the commission had tried to cover up the manipulation. Mpofu said the V11 forms produced in court showed that they had been signed and stamped, but had not been populated. This entailed that they had no figures, proof of the irregularities. Zimbabwe Chief Justice Luke Malaba is presiding over the case with eight judges of the apex court. The constitutional court has 14 days from the day the the case was filed to make a determination on the matter: to order a re-run of the 2018 election, order a recount of ballots cast in the July 30 vote, or declare a winner.